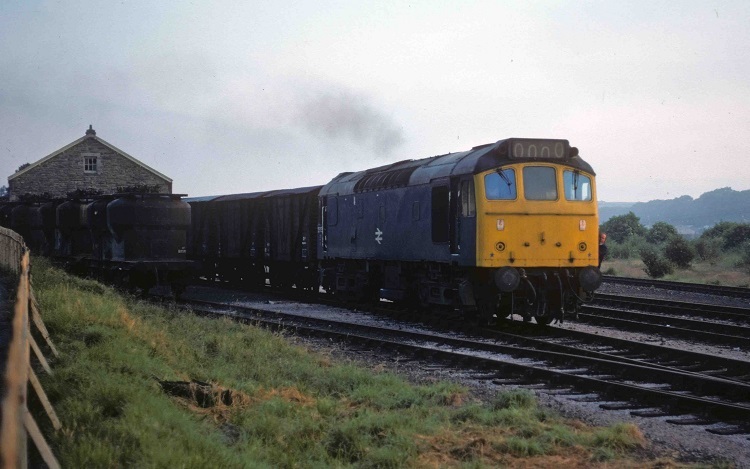 Photograph courtesy Roger Geach 25155 shunting at Wadebridge at 05.40am on the morning of July 4th 1977. This freight did not last much longer and although it was a regular Class 25 turn, because of the early morning time few people went and photographed it. By 06.00am it was all over with the freight on its way back to Bodmin Road. The sixteen year five week career of D7505/25155 was split almost equally between London Midland Region & Western Region depots. Dual brake equipped (September 1975). Time between last Classified repair and withdrawal: 62 months. December 1964 to Burton (16F). February 1968 to London Midland (Midland) Lines. December 1972 to Cardiff (86A). October 1980 to Springs Branch. November 15th 1980 to unserviceable store at Swindon Works. 25155 was the 76th Class 25 withdrawn, one of seventeen Class 25s retired during December 1980. 25155 was broken up at Swindon Works by the end of September 1981. Noted Derby Works August & September 1975 (dual brake equipment fitted). Condition March: two-tone green livery with small yellow warning panels, three-rung bogie mounted footsteps, straight sided sandboxes. During its operating career D7505/25155 handled a modest number of passenger workings. On May 21st 1966 the 08.36 Nottingham - Llandudno Town and return working were handled by D7505 & D5280. On January 13th 7505 worked the 20.10 Exeter St David - Newton Abbot. On February 28th 7505 worked the 20.10 Exeter St David - Newton Abbot. The 20.10 Exeter St Davids - Newton Abbot was worked by 7505 on March 17th & March 24th. The next day (25th) 7505 piloted 6514 working the 17.55 Exeter St Davids - London Waterloo as far as Chard Junction, where it was removed to assist failed 7577 with 6A19 16.55 Chard - Morden Milk. On March 30th 7505 worked the 20.10 Exeter St David - Newton Abbot. On June 3rd & June 10th 7505 & 7574 worked the 7B34 19.40 Bristol Temple Mills to Ponsandane freight, the 1E21 10.30 Penzance to Bradford passenger service to Plymouth, then light engines to Laira depot and ending with the 7B31 18.20 Plymouth Friary to Par freight. On June 17th 7505 handled the same diagram but now paired with 7504. The diagram 7B34 19.40 Bristol Temple Mills to Ponsandane freight, the 1E21 10.30 Penzance to Bradford passenger service to Plymouth, then light engines to Laira depot and ending with the 7B31 18.20 Plymouth Friary to Par freight was worked by 7573 & 7505 on July 29th & 7503 & 7505 on August 5th. On September 16th 7508 & 7505 worked the 7B34 19.40 Bristol Temple Mills to Ponsandane freight, the 1E21 10.30 Penzance to Bradford passenger service to Plymouth, then light engines to Laira depot and ending with the 7B31 18.20 Plymouth Friary to Par freight. On September 29th 7505 was noted shunting china clay wagons in St Blazey yard. Condition March: blue/yellow livery, three-rung bogie mounted footsteps, through steam pipe still fitted. On July 18th 1975 33007 failed at Sherborne on a Waterloo - Exeter St. Davids working, 25155 & 25093 dragged everything to Exeter. Three months later on October 18th 25155 & 25139 were noted arriving at Edinburgh on a day excursion from Manchester Victoria, did they work throughout or just forward from Carstairs? 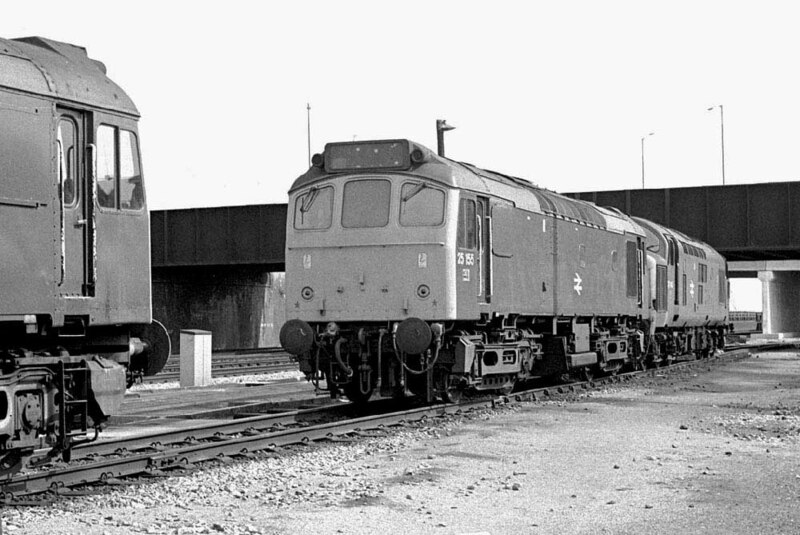 Photograph courtesy Tony Sayer During the early 1970's Class 25s were transferred to South Wales to cover a number of duties including their use in pairs on the heavy iron ore trains. These arduous workings brought about a multitude of failures, usually related to the motors or the electrical control equipment. Seen here at Ebbw Jct on July 25th 1976 is 25155. On October 2nd 1976 25155 hauled an InterCity diesel multiple unit as the 06.30 Crewe – Cardiff passenger, this route was frequently seeing locomotive hauled substitutions due to the poor reliability of the diesel multiple units, with many being away at Works. Cardiff’s diagramming of Class 25s on freight duties ended in early January although they were still much in evidence in the Newport area handling the Machen stone trains and the Uskmouth branch trips – 25155 being noted on January 21st. At this time Newport drivers were being trained on the Class 31’s, 31296 being the first, and used on the early morning Newport - Bristol parcels. 25155 was handling the Uskmouth trip on March 22nd. Despite spending over eight years allocated to Western Region depots including over four years at Laira, there are few recorded passenger workings during these years. On September 23rd 25155 worked the 11.10 Plymouth - Penzance. 1978 produced some local Devon workings; on June 28th 25155 worked the 16.40 Plymouth - Paignton, on September 2nd the 08.25 Paddington - Barnstaple forward from Exeter St. Davids with 25058 and on September 17th the 17.55 Paignton - Exeter St. Davids. A surprising visitor on the 15.55 Bristol - Plymouth parcels on September 7th was Haymarket based 25011, which worked as far as Exeter, replaced here by 25155. On September 9th 25155 was noted at Exeter stabling point during the early afternoon, it would then work the 13.40 Exeter - Barnstaple and the return 15.52 Barnstaple - Exeter. On September 11th 25155 was noted at Exeter stabling point during the morning. On September 16th 25155 was stabled at Exeter shortly after midnight. On October 11th Laira based 25155 was at the sugar beet plant at Ely. The 08.25 Paddington - Barnstaple on June 16th was worked forward from Exeter St. Davids by 25155. On June 23rd 25155 was noted at St Blazey. Photograph courtesy Andy Hoare After many years of work in and about the East Midlands the transfer of 25155 to the West Country brought a whole new set of workings. Of trips to the furthest south-west station in the country, local passenger workings along the scenic coastline of Devon & Cornwall and dealing with the Devon banks on china clay workings. Its the summer of 1979 at St Austell and 25155 needs a touch-up to the cab front paint job. The evening St Blazey - Longport china clay train was worked by 25223 & 25155 on February 15th. 25155 and 37299 formed a strange partnership for working the 'Penzance Pullman' railtour over a number of Cornish branches on April 26th. The railtour originated at Paddington, celebrating the end of normal express passenger locomotive hauled services between Paddington & Penzance. 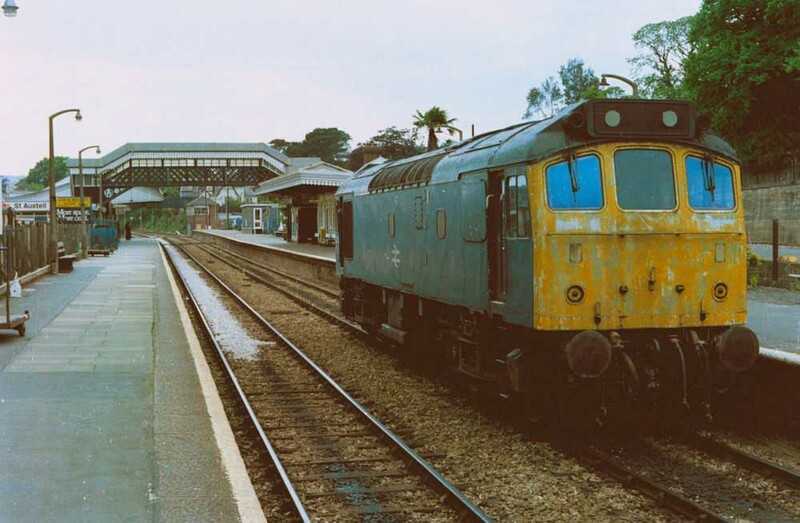 The Class 25/37 combination took over from 50028 at Plymouth, then proceeding to Saltash - Lostwithiel - Par - Goonbarrow Junction - St Dennis Junction, then returning to Par and then westward to Penzance. After running round the train at Penzance the 25/37 combination returned the railtour to Plymouth, where 50028 took over for the trip back to London. All but one of the WR Class 25s were either withdrawn or transferred to the London Midland Region on October 6th, Laira kept one for the St Blazey – Truro – Penzance trip working, by November 3rd this too had been taken over by a Class 37. Likewise the Scottish Region sent eight machines to the LMR and withdrew five more. The LMR itself condemned seventeen machines and placed six into storage. A number of these transferred machines on arrival at their new depots were found to be only fit for scrapping, 25155 was in this category. The final passenger working for 25155 took place on October 10th 1980 working the 15.52 Barnstaple - Exeter St. Davids. Shortly after this 25155 was transferred to Springs Branch. 25155 was sent down to Swindon Works, being stored then on November 15th and officially withdrawn on December 1st. Page added August 17th 2013.